Ensor expert, Xavier Tricot, has written a new online publication for the website James Ensor. An online museum. This is an initiative of the Flemish Art Collection. The Flemish Art Collection is the collaborative association of the Royal Museum of Fine Arts, Antwerp (KMSKA), the Museum of Fine Arts, Ghent (MSK, Ghent) and the Groeninge Museum in Bruges. On 14 August 1896, an enormous fire destroys the Saint Peter's Church in Ostend. The fire of the Saint Peter's Church must have seriously affected James Ensor. During his entire life, Ensor was very much concerned with the patrimony of his birthplace. 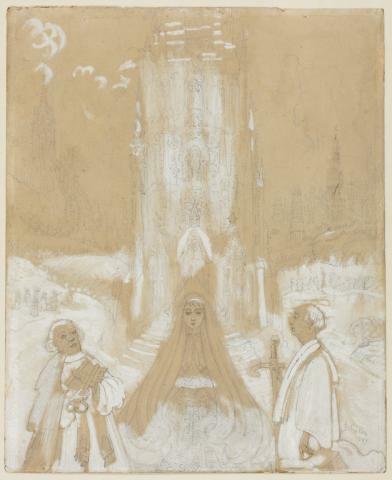 In 1897 Ensor made the heightened drawing Project for a Chapel dedicated to Saints Peter and Paul, now in the collection of The Art Institute of Chicago.